Biography of the respected Brazilian anarchist-feminist teacher, journalist, writer, lecturer and poet. Maria Lacerda de Moura was a teacher, journalist, writer, lecturer and poet and in everything she did her anarchist beliefs in human emancipation shone through, even when she never explicitly used the word ‘anarchism’. She was born on the Monte Alverne farm in Manhuaçu in Minas Gerais state, Brazil on 16 May 1887. She was the daughter of Modesto de Araújo Lacerda and Amélia de Araújo Lacerda, freethinkers and educated folk from whom she certainly inherited her strong anticlerical outlook. Five years after she was born they moved to Barbacena, the town where she started her schooling and by the age of 16 she was training as a primary teacher, the profession to which she was deeply committed. One year later she married Carlos Ferreira de Moura, the companion who always supported her – even after their relationship had ended. In 1915 the couple adopted two orphans, a girl and one of Maria’s own nephews. At that point, she was so committed to her profession as an educator that she set up the League Against Illiteracy and gave free classes. From that valuable experience she came to the conclusion that the purpose of the educational system was to shape people’s personalities, forcing them to abdicate their own individual identities in order to tailor their behaviour to what suited the interests of the established order. Furthermore she realised that it was not enough just to fight illiteracy if they were to achieve a fairer world. That would require a more profound change, a real social revolution! So she embarked upon her study and investigation of libertarian education as well as delving into the social question. In 1918 she began her career as a writer, issuing her first book On Education. Such was the impact it made that the following year she published two follow-ups Why Does the Future Triumph? and Renewal. In 1921 she and the family moved to the city of São Paulo where she started work as a private tutor. At that time of great social upheaval she started to give lectures (some in the city of Santos) to trade unions, cultural centres, anarchist theatre groups and labour associations and the likes of the Printing Workers’ Union, the Anticlerical League and the Union of Footwear Crafts. She also started to write for the anarchist press, among it the newspaper A Plebe where she wrote about ‘the underlying and ancillary sciences of education and educational psychology’ carrying on and adding to the work done in that field by Neno Vasco with the weekly newspaper A Terra Livre in 1906. At around the same time she helped to found the International Women’s Federation and the Women’s Anti-war Committee, based in São Paulo. The object of both organisations was to organise the women of Santos and São Paulo into a movement for human emancipation that would look beyond simple electoral goals, since in those days many women saw the most important goal as winning female suffrage. 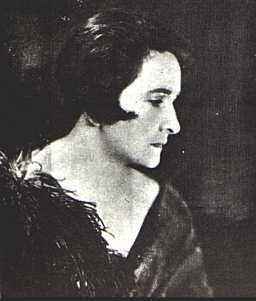 In February 1923 she launched the monthly review Renascença which made no bones about spreading libertarian feminist ideas and dealing with other social issues. This review was circulated in nine states of Brazil as well as in Argentina and Portugal. The following year she issued her most famous book Is Woman Degenerate? by way of an outraged retort to the thesis ‘Epilepsy and pseudo-epilepsy’ written by the psychiatrist Miguel Bombarda in which he tried to show through pseudo-scientific case studies that woman was man’s biological inferior. In 1926 she issued another class work: The Religion of Love and Beauty. In 1927 she parted from her husband Carlos once and for all, although they remained on very amicable terms. Due to her great popularity in countries such as Uruguay, Argentina, Chile and Mexico she was invited to give talks in Montevideo, Buenos Aires and Santiago. On her return she carried on with her activities as a libertarian propagandist in São Paulo until she moved in 1928 to Guararema in the interior of São Paulo state where she lived on a farm belonging to a commune that included the Italian anarchist Artur Campagnoli. The commune was made up of Italian, Spanish and French conscientious objectors to the Great War who intended to live together in harmony in an egalitarian libertarian arrangement whilst offering peaceful resistance to all forms of violence. During Maria’s time on the farm, she set up a school for the commune’s peasants and after that bought some land nearby where she built a modest home and schoolroom. All without giving up on her writing activity: in 1931 she issued two more books, Clergy and State and Civilisation – Body of Slaves. In 1932 she published yet another outstanding book, Love … and Do Not Multiply. In 1934 suffering from severe rheumatism she was forced to quit her home in Guararema to move into Rio de Janeiro where, although greatly weakened, she carried on writing for the local press and giving talks to labour circles. In 1935, under pressure from the repression emanating from the dictatorial Getúlio Vargas government she returned to Barbacena with the intention of ending her days there with her mother. But she was barred from teaching in the public school system by the authorities who regarded her as a ‘dangerous communist’. So, in 1937, she returned to Rio de Janeiro where she was obliged to work hard just to survive. In 1938 she moved to the Ilha do Governador meaning to give more lectures on education and libertarian subjects. In 1940 she published her last book, a handbook entitled Portuguese for Commercial Courses, in which, among other things, she included an essay by José Oiticica on ‘Style’. In September 1944 her mother died and in December she moved back to Rio de Janeiro once and for all. Maria Lacerda de Moura died on 20 March 1944, aged not quite 58. Her funeral was a modest affair with no wreaths and only a few flowers. Among the labour papers she wrote for were O Culinário Paulista, A Patrulha Operária, A Plebe, A Lanterna and O Trabalhador Gráfico. Among her closest friends were the anarchists Rodolfo Felipe, Angelo Guido, José Oiticica, Osvaldo José Salgueiro and Diamantino Augusto. Maria Lacerda de Moura led an intense life questing after genuine social equality: she was the first Brazilian feminist to express her thoughts in newspaper, review and book form. In Brazil she pioneered the spread of a stand against fascism and campaigned against experiments on animals. Her work reached out to the continents of America and Europe and yet her output and her story are glossed over and maliciously ignored by contemporary historians. All because in her life pride of place was given to honesty in that she had no interest in the party political game. Maria Lacerda de Moura was a real revolutionary in the full sense of the word. An exemplary woman whom today’s reformist feminists would rather forget. From: Singularidades (Lisbon, No 16, November 2000) . Translated by: Paul Sharkey.